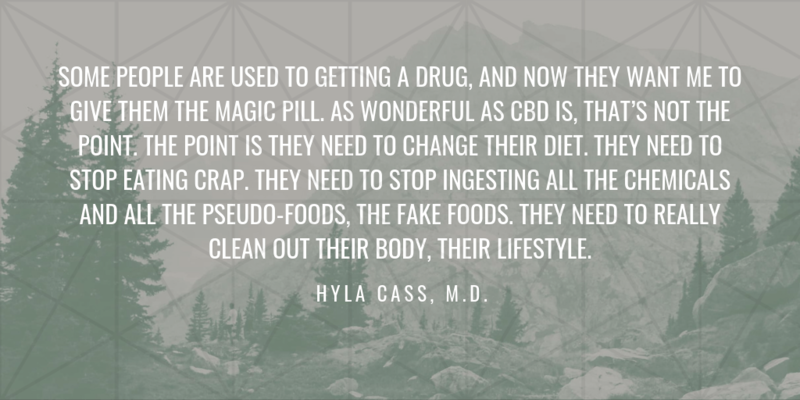 The age of plant and natural medicine is here, and thought-leaders and medical professionals such as Dr. Hyla Cass, MD are leading the charge. For decades, CBD and hemp products have had negative connotations without fairly being studied or anecdotally applied. We at Cured Nutrition, and most likely you too, believe in the healing power and myriad of overall health benefits of this amazing plant. Class is in section, and Cass is your professor! Nationally acclaimed innovator and expert in the fields of integrative medicine, psychiatry, and addiction recovery, Dr. Cass helps individuals to take charge of their health. One area of expertise is helping individuals to withdraw from both psychiatric medication and substances of abuse with the aid of natural supplements, some of which are part of her own line of innovative nutritional supplements. A member of the Medical Advisory Board of the Health Sciences Institute and Taste for Life Magazine, she is also Associate Editor of Total Health Magazine, she has served on the boards of California Citizens for Health and the American College for Advancement in Medicine (ACAM). A native of Toronto, she graduated from the University of Toronto School of Medicine, interned at Los Angeles County-USC Medical Center, and completed a psychiatric residency at Cedars-Sinai Medical Center/UCLA. She is a Diplomate of the American Board of Psychiatry and Neurology (ABPN), and of the American Board of Integrative Holistic Medicine (ABIHM). What does true health mean to you? Connect with us on Instagram @curednutrition and share your journey on our most recent post! For any questions regarding Cured Nutrition products or our movement please email us directly at support@curednutrition.com. Joe: Dr. Cass, thank you so much for joining me here this morning on The Cured Collective Podcast. When I first connected with you through Drew, who I met at Summit, I was super stoked to see all the work you’re doing, so I want to just thank you for taking the time to join us on the podcast. Dive into a little bit of your background before we get into the tasty endocannabinoid stuff. Dr. Cass: Sure. Well, I am a psychiatrist and I’m actually one of the pioneers in approaching it from a biological, biochemical, or functional medicine point of view. That is, working with the body’s natural chemistry rather than using medications, which is the usual treatment, ’cause what happens with medications is you get a dampening of symptoms, but you’re not actually dealing with the root cause and you’re not getting anywhere near a cure or even a treatment. Dr. Cass: I am a non-drug psychiatrist, and yeah, sometimes I’ll write prescriptions. I’m not adverse to it. Sometimes in acute situations it’s what’s called for, but to put people on meds and then adding more meds and more meds and changing them and going on indefinitely is really detrimental, ultimately. Joe: Yeah, yeah. I was … I went through a pretty tough depression about six, seven years ago now, and I was put on Zoloft really quickly. I was walking numb through life for a little while after I was put on that, and I actually made … It made my symptoms worse and from that … It was a lifestyle thing for me, but as soon as I started to shift away from that into focusing on nutrition and working out and taking care of all these other pieces of my life that weren’t being evaluated when I was prescribed something, then I started to see things change. Dr. Cass: That’s what it does. That’s exactly …. That’s what the SSRIs do. That’s the classic drugs, the selective serotonin reuptake inhibitors. Prozac, Zoloft, Paxil, Celexa, and so on. They totally … They numb you up. People report having like a chemical feeling, like no feeling, and they’ll go to a funeral and not cry because they can’t get in touch with their feelings and it’s actually quite distressing. Dr. Cass: What we have also discovered, there’s research showing that good exercise, that is aerobic exercise, 30 minutes several times a week, can actually be an amazing antidepressant comparable to the SSRIs, but you’re actually doing your body good rather than suppressing all these side effects, which as you know, can be quite bad including loss of libido, nausea, stomach upset, actually even suicidal thoughts and feelings. People who have never been suicidal ever, even when they were depressed, become suicidal from the medication. Very sadly, some of them actually succeed in committing suicide. That is a tragedy that is not being publicized enough. 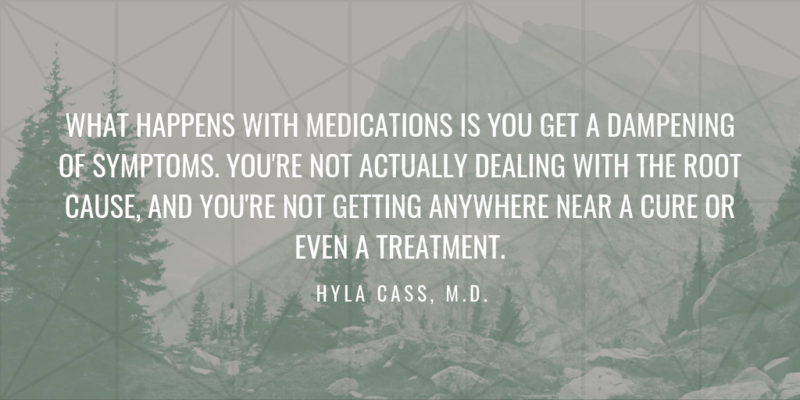 Dr. Cass: No one tells you when you get on the drugs that you can’t get off them. It’s really [crosstalk 00:03:54] really, really hard to get off them. I’m one of the few docs around who is actually helping people to get off of medications, and I do it by using supplements to kind of cushion it. By the time the person’s off the medication, they’ve replenished their stores of neurotransmitters and they’re in a better place than they were even before they started the medication. Joe: Like, where did this come from? Dr. Cass: I began to explore … This was the early years of what was called Orthomolecular Psychiatry, started by Linus Pauling, Abram Hoffer, and they were my mentors. I began using vitamins with my patients, and at that time it was fairly simple and it became more and more sophisticated. We began introducing amino acids. I formulated some of my own supplements, because at the time, we couldn’t even get good formulas. I had my own formulas ever since and I tweak them frequently to help people rebuild their brain, rebuild their neurotransmitters, and really break free from the whole model of medication. Joe: Yeah, it’s extremely interesting because when I was put on medications … I’ve struggled with anxiety my entire life and I’ve taken … I’ve used Benzos and then my anxiety and my lifestyle in college led to depression, and then obviously, I was put on the SSRIs. I had seen … My Mom’s in the medical profession as well, and I had seen her using medication her entire life and I just started to question. It didn’t seem like … It seems like there was another way and I was seeing multiple therapists when I was extremely depressed. Dr. Cass: Quite. Quite. He’s an old friend. Dr. Cass: We were pioneers together. 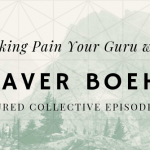 He just got more famous than me and developed the whole program at the University of Arizona, which has made an amazingly powerful contribution to mind-body connection, alternative medicine, holistic health, however you want to term it. I have great admiration for his contribution and for him. Joe: Yeah, well, I’m super thankful for the both of you, because if it weren’t for you guys, I wouldn’t be doing what I’m doing now. Talking about other approaches. The reason why we got connected was because of cannabis, and that is where I want to spend a lot of time here because it is … There’s … Well, people like yourself are on the forefront, but we’re still in the infancy of the ability to be able to study what cannabis can do for us. When did you become interested in this world and start studying and understanding the endocannabinoid system? Dr. Cass: Oh, a couple of years ago it began to raise its profile, its public profile, and I saw it really as part of this whole functional medicine world that I’m in. It’s one more tool in my tool box, and a very good one because it turns out that cannabis, and what I use is CBD or hemp-derived CBD which is less than .3% THC. We have discovered that you don’t really need the THC, so with medical marijuana, much of the effect is the CBD part, and that’s what we’re learning. Dr. Cass: A lot of people don’t want to have that high feeling. Certain people … A lot of people want to get high, but a lot of people don’t. They want to get all the really good benefits of CBD, and I found that it fit perfectly because what I’m doing with my work is I’m balancing neurotransmitter or neurochemicals, dopamine, serotonin, GABA. What CBD does is it actually acts like a moderator or modulator of these neurotransmitters, a balancer. It also balances hormones. It balances the immune system. It stops inflammation, and we’re finding out that so much of depression, anxiety, Alzheimer’s, so many brain conditions are actually brain inflammation. Dr. Cass: Look at this one-stop shopping, CBD. Enhances neurotransmitters, it decreases inflammation. I mean, it has so many qualities that it was like the missing link, and it has been the missing link. As long as we weren’t using hemp, we didn’t have hemp in our diet, we were missing this. Now that we have CBD, I’ve seen people just blossom. Dr. Cass: When you own lumber, you want to make paper from trees, right? Dr. Cass: It’s a revolution. Dr. Cass: Including fuel and cars and you name it. Replacing plastic, which has just become a scourge. Here we will have a biodegradable form of construction material. Dr. Cass: It’s remarkable and it … Really revolutionary. It’s really sad that it was suppressed for all those years and for all the wrong reasons. What I have found … By the way, for me and my work as a psychiatrist, and by the way, as a psychiatrist, I’m also treating a lot of other things like the gut and the immune system and all of that … Things like traumatic brain injury or addiction or seizure disorders, dementia, all of these things that have had real problems finding something that works, the meds don’t really work for any of these. Psychosis, even, the drugs will dampen the symptoms but they’re not gonna change a psychosis. They’re not gonna treat or cure a psychosis. Dr. Cass: There is research showing that using CBD can actually … Is actually comparable in terms of symptom relief of psychosis but without all of the really gnarly side effects of the antipsychotic medications. Dr. Cass: We actually haven’t, but now it’s interesting is that the CBD isolate they say, “Oh, you can take up to 1500”, and that’s ’cause you have to take pretty high doses of CBD isolate because it doesn’t have the advantage of all the other ingredients that come in the whole plant. When you use a full-spectrum plant, you use a full entourage. All the cannabinoids, of which there are over a hundred and the terpenes, which are of tremendous medicinal benefits and other ingredients. Dr. Cass: Slowly as you … As I’ve had to have people go down when I’ve given them things like theanine and GABA to ease the withdrawal. Joe: Yeah, so you mentioned CBD isolate and I … You dove into the entourage effect of the full-spectrum extract and how all the cannabinoids and the terpenes work together. Can we kind of dive into the actual endocannabinoid system and how the receptors work? Then the endocannabinoid system and what it’s responsible for? We’ve talked about a lot of potential uses for it, but what about how … Like, what the endocannabinoid system actually controls? Dr. Cass: In the body. I mean, it was used in ancient China, ancient Greece, Egypt. The archives show great use for cannabis, and for the same indications that we’re using them now, but it wasn’t until 1992 that Professor Raphael Mechoulam in Israel discovered the … What was then the THC receptor because he was looking for, where does THC operate? He’d been studying it for years, for 30 years, but didn’t know where it acted and finally discovered that there was a system that it interacted with. That was the first … That was the beginning of the discovery of the endocannabinoid system. Dr. Cass: It turns out the endocannabinoid system is a master regulator and communicator, and it actually connects the neurological system with neurotransmitters, endocrine system, which is our hormones, meet with the immune system with inflammation. Basically, it’s a modulator and a communicator, which is pretty amazing. It works locally, so if there’s a need for pain relief right away, you have an injury somewhere, the local cells will be made to release the natural endocannabinoid, which there’s two of ’em. There’s 2-AG and anandamide. Those are the ones that are made in our body that we make ourselves. Those are called the endogenous or inside cannabinoids. Then there are the external, the phytocannabinoids, which means plant-based cannabinoids, which are THC, CBD, and all of the other cannabinoids. They act on the CB1 and CB2 receptors. 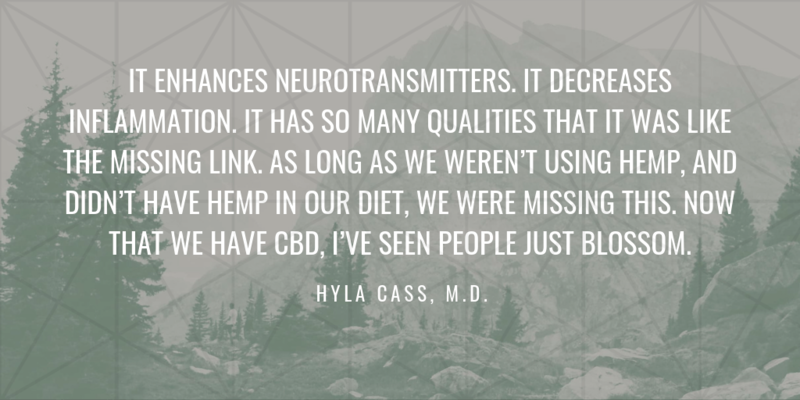 Dr. Cass: The CB1 receptors and the … You don’t have to remember so much CB1, CB2, but just know that the brain is … Various parts of the brain are very rich in receptors, and some really remarkable effects can be had by the effects of the … By CBD and THC on the brain. Actually, THC reacts directly with this CB1 receptor. CBD reacts indirectly by preventing the breakdown of the endogenous or the anandamide and the 2-AG. It’s a very sophisticated little system there, and I know it may not be easy to catch what I just said. Was that [crosstalk 00:18:07] … Was that clear? Joe: Well, you said it’s a modulator. Dr. Cass: We had an epidemic of it. 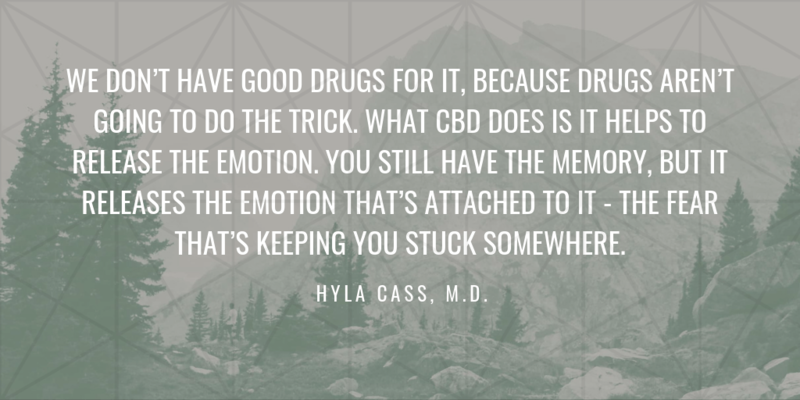 Dr. Cass: We don’t have good drugs for it, because drugs aren’t going to do the trick, but what it does is it helps to release … It actually releases the emotion. You still have the memory, but I releases the emotion that’s attached to it, the fear that’s keeping you stuck somewhere. For example, if you’ve had … If you have shell shock, coming back from battle, and every time you hear a car backfire you think it’s a bomb and you dive under the nearest thing, it’s very disabling and very hard on the system. When you … When these people take CBD, they actually can hear the car backfiring after that and it’s a car backfiring. They no longer have it associated. It breaks the association between that and the terror that they had when they were dealing with bombs and fire … Gunfire in war zones. Dr. Cass: The GABA keeps circulating. The same thing with the 5-HT1A receptor for serotonin, and GABA and serotonin are the two neurotransmitters that help us to keep calm and the … In addition, serotonin helps us keep calm and happy, not depressed. Helps us sleep better. GABA helps us keep calm and it also keeps us having muscle calm, muscle relaxation. Joe: Like any tension that you have in your next, that leads to headaches, that like … It’s … Everything’s a chain effect and that’s exactly what you’re saying is a lot of things are just like surface-level bandaids. It’s extremely interesting to now be actually looking at things that are gonna attack the root cause and it’s so important that we continue to do that, but it’s the battle that you’re fighting and I’m trying to fight as well. Dr. Cass: I’ve used both, actually. I will give people a capsule once or twice a day, morning and night, and then they can titrate in the middle with liquid, ’cause a liquid’s gonna come on sooner, not last as long. Whereas the capsule takes longer to become active, but by the same token, it lasts longer. It releases its load more slowly. It’s nice to have all these different forms and there’s also vapes, there’s sprays. Those are much quicker, so if somebody has a migraine coming on, it’s been brilliant for migraines. See, these are the things that we don’t have treatments for. Migraine medications are pretty abysmal. I had been giving people magnesium. Magnesium’s very helpful with migraine and other minerals useful, but having CBD has been really almost miraculous in a lot of cases, so that’s migraine. Dr. Cass: The seizure disorders, we have children with these just devastating … A hundred seizures a day. You can’t even imagine that. This was on Weed … Sanjay Gupta did the series Weed, where he was originally against marijuana. Ended up being very pro weed, but really you can get the anti-seizure effect using CBD, and now there’s a drug called Epidiolex, which is CBD isolate, so we now have a drug. Very expensive, maybe it’s covered by insurance, we hope, but I actually will vote for the entourage effect of the full spectrum. Being pharmaceutical, they’ll … That’s sort of the pharmaceutical model is to have a single molecule, and it’s the CBD molecule. Joe: Okay, so then we … You could probably, obviously, take less if you’re just using a full-spectrum oil? Dr. Cass: Yes, I would think so, and that’s an excellent question. I haven’t treated this. I leave it to neurologist, although the truth is, there are a lot of very active parents that are looking this up and treating their children themselves because they don’t have a doctor who’s knowledgeable. You can check out the parent groups. I have to say they’re … They get very sophisticated. Or the autism parents, they really do have to share information because the conventional treatments for autism are pretty bad. They’re pretty lacking. Dr. Cass: With autism, what we’ve done is we treat the gut. Very much, treat the gut, treat the spirosis in the gut or imbalanced gut microbiome, and adding in the CBD has been really remarkable and in some cases there are some groups that talk about how they’re adding in a little bit of THC. In fact, what they do is they have pure CBD and pure THC and they will mix and match based on the child’s particular behavior that day. These parents really, really understand their children and how to treat them, and these kids can be mainstreamed, which is quite miraculous. Dr. Cass: You can’t … You just watch a mom talk about it, and I did actually. I was at Natural Products Expo and this woman was on a panel and her daughter was the one that Sanjay Gupta did Weed about, and it was … I mean, there wasn’t a dry eye. This woman, what she was suffering with that child, it was just … The whole family was just destroyed by it, and she had to move to Colorado in order to get … Even to use hemp. She did and the rest is history. That little girl is fine. She is not having seizure and none of the pharmaceuticals worked. Here we have proof positive of something as devastating as a very serious seizure disorder being controlled by something from, guess what? From nature. Joe: A lot more sedating. CBG, which is the precursor to almost … I think actually all the cannabinoids. That seems interesting to me. We actually have it here at my company in the isolated form and we’ve been playing around with it because we like to test everything, but I think it’s super interesting and I’d be curious to hear your thoughts on other cannabinoids and where we’re at now with that. Dr. Cass: The terpenes, and the terpenes are amazing. The terpenes occur also in other plants. By the way, cannabinoids occur in other plants as well. In ginger and echinacea, so we have been getting cannabinoids, but just not as powerfully as in the hemp plant. Beta-Caryophellene is brilliant for inflammation, and it’s kind of a cross between a cannabinoid and a terpene. Kind of falls between the two categories, but you can isolate Beta-Caryophellene and have a very good anti-inflammatory. We know that the conventional anti-inflammatories have serious side effects like GI bleeding, for example. Serious, and actually deaths as a result. What we’re dealing with is just a real … It’s a real sea-change because it’s come about … The results are incontrovertible. Dr. Cass: Now with Epidiolex out as a drug for seizure disorder and so much interest in CBD as a medicine, we’re really on the upswing, and this can change really the work that I’ve been doing for years and years and years, which has always been upstream … It’s only been a small number of people who find their way to me who say, “I hear you get people off medication. I am tired of being on it. My doctor won’t take me off or says I can’t go off or if I go off I’ll get worse than I was before.” Yada yada. It’s a lifetime commitment, so they come to me and they actually change over over a period of time to more natural supplements, and CBD is just so powerful in this regard. Dr. Cass: No, no, no. That … No, that’s not how it works anymore. Dr. Cass: Not anymore, no. Early on, 20 years ago, 25 years ago when I’d suggest to someone, “Would you be wiling to try?” They were or they weren’t, and I was not interested in perpetuating their medication prescriptions. I’d say, “Why don’t you go back to who you were with.” Now, people are so self-selective. They may want to see me ’cause they know that I am not gonna ply them with medication. If they do need medication, I’ll be the first to say … That’s a good thing, too. Some people should not be off their medication. Dr. Cass: By the way, don’t do this by yourself. You really need to have some supervision and go off the medication fairly slowly, titrate off, because if you go off suddenly, you go into a big withdrawal and you’re worse … You feel worse than you did … If it was going off of Benzo and you go off precipitously, you feel worse than your worst anxiety ever. It can be mitigated with CDB, with fairly high-dose CBD, but better to go off more slowly, more comfortably. You don’t have to be heroic. It’s not good for your system. Dr. Cass: As I said, people at this point are self-selected. There’s enough word out there on the street that there are people like me doing this kind of work. Dr. Cass: It’s a partnership. They’re used to … By the way, some people are used to getting a drug, and now they want me to give them the magic pill, and I am not giving them the magic pill. Wonder as CBD is, that’s not the point. The point is they need to change their diet. They need to stop eating crap. They need to stop ingesting all the chemicals and all the pseudo-foods, the fake foods. They need to really clean out their body, their lifestyle. They need to exercise, as you discovered. Very important. Change, change a lot of things. Dr. Cass: Reduce the stress in their lives. This can be done with meditation. It doesn’t have to be just sitting quietly meditation. There’s walking meditation. There’s this mindfulness, being mindful as you go through your day. The different ways of coming home to yourself, so that’s all part of it, and unless someone’s willing to do … You don’t have to do a hundred percent of it a hundred percent of the time, but you have to have some commitment to yourself, to your body, to your brain, to wellness, or … It’s not just to change up a drug for a natural product, but it’s really a change in lifestyle and your approach to life, your approach to your health, and then you have a richness in your life that you didn’t have before. I think you’ll attest to that. Joe: Yeah. Yeah, and that’s the thing that more and more people need to realize is, what is it that you can do where you can be fully 100% present, you’re breathing, and you’re just focusing on the task at hand? To think about getting anxious about that, I don’t get anxious when I’m cooking, I’m focused on nourishing myself and taking care of myself because, really, it’s just loving myself and that was … I mean, it’s a process. It’s not easy at all, but yeah, it takes time and practice and continuing to show up for yourself. Joe: I love the words that you said, “coming home”, because that’s what it is. That’s what we’re all trying to do and at the end of the day, there’ a lot of great tools out there, but what we really want to do is come home to ourselves and find our true selves and our inner selves, and that there’s a lot that comes into play when we’re doing that. Dr. Cass: Well, appropos that, it’s also important to have support in your own network. When I have, for example, one member of a couple who’s committed to this and their partner is not, that’s a problem. They’re already in a relationship, it’s not about who you’re choosing once you’re there, but the other person can really sabotage it, ridicule it, belittle it, and undermine your trying to be your best self. Dr. Cass: The psilocybin work from Hopkins … Also NYU for OCD is really remarkable. I’ve been following Rick Doblin and MAPS forever. I was in on the early, early meetings 25 years ago, something like that, anyway, a long time ago. I think it’s brilliant, so instead of people … This is the use of psychedelics to change your brain, again to bring you home to yourself, to reboot the brain, and that is again remarkable because conditions like OCD are very difficult to treat. I would love to be able to treat my OCD patients with a course of psilocybin. In fact, I think it was only one or two sessions … I don’t … Do you remember the protocol? Joe: I don’t. I’ve been studying a lot of the MDMA work as well, but I think two sessions is what I’ve heard, to be honest. Dr. Cass: Okay, and this was done with an IRB, with institutional review board under research supervision, so it’s very carefully controlled and people have a lot of therapy along with it. They’re not just given the psilocybin or MDMA, but they’re actually not so much talked to during it, because during the experience they’re experiencing it, but they have a guide there. If they have … If they want to say anything or ask anything or they have any concerns, but there is a lot of therapy before and after. That’s part of the whole package. What you end up with in a fairly short time, rather than being on meds forever that don’t really work or even being on supplements that are … Can work but it’s … You’re always having to work it, this actually changes. It changes your brain. Dr. Cass: With OCD, it’s like there’s this loop, a continuous loop that just goes … A tape loop that goes and goes and goes and goes, and very hard to break. With these products, you actually break that cycle, and as I said, reboot your human computer, your brain, and it doesn’t come back. Dr. Cass: The symptoms don’t come back. Joe: Of things. PTSD, so is that … Are we actually creating new neural pathways? Or … What’s going on? Dr. Cass: I think we are. I think we are. CBD helps here as well because it helps to create new neural pathways. Dr. Cass: Oh, I could tell. Joe: That’s what we stand for as a company, our name is Cured Nutrition. We’re not saying that we’re the cure, but we are saying, “Let’s change our perspective. Let’s look at the triangles that are our logo. The delta stands for change, and let’s be part of that. Let’s bring the experts on to this platform. Let’s find the consumers that are struggling to find their self and their home and their life that they so deserve. It’s gonna take a lot of forward thinking, it has a lot of resistance to it. Joe: Yeah, I couldn’t do that for a long time when I was working in the aerospace industry and for the government. I’m excited to now be doing this and I’m super thankful for what you’re doing, and I’m curious about the resistance that you’ve had to fight through over the course of your career, especially in the earlier years when we started this cannabis stuff. Dr. Cass: When people ask me, “Well, what do all the psychiatrists think of you? Do you get into trouble?” Like, “No.” First of all, I don’t know what they think of me, and what they think of me is none of my business. They’re doing what they do and I do what I do, and the people who want to see me are gonna see me, and the ones that want to see them will see them. My job is to educate doctors as much as possible, and I’ve been speaking at medical conferences for years whenever I can and talking about all of this and doing it on TV. Doing it in whatever capacity I can to spread the word that there are healthy, natural alternatives that work with the body’s chemistry instead of just suppressing symptoms. Dr. Cass: I think the word has gotten out. There’s really a rising mass of people that are believing in this, that are living this. Quite a different world now than when I started, and I’m really glad for it. Very grateful. Dr. Cass: Yeah. First of all, you can find me at C-A-S-S-M-D.com, cassmd.com. Pretty simple. Doesn’t have my first name in it, just cassmd.com, and go to the supplement section and you’ll see the supplements that I’ve actually developed, like my Brain Recovery AM and PM, which is a combination of six different formulas, really. One of them … Mixed in together is all the components of the multivitamin, all the components of a blood sugar balancer, components of a liver detoxer, and boy, do we need that for people who are coming off of medications and substances of abuse. They’ve really abused their liver. They need that, and the amino acids. Amino acids that are precursors to GABA, serotonin, dopamine. Dr. Cass: I decided to do one-stop shopping. I’ve added some antioxidants like alpha-lipoic acid, which is also good for blood sugar, vitamin C, and all kinds of … It’s not exactly the kitchen sink, but it’s all the things you need for a basic nutrient, particularly if you’re not wanting to go on medication, on psych meds, coming off of them, or coming off of substances and abuse. It helps to restore your brain, your body, your neurotransmitters. That’s called Brain Recovery AM and PM, and I describe it really pretty thoroughly, and then you can add in other … That’s at my base, and you add in some things. If you tend to have trouble with focus and concentration, you add in my Focus Formula that has Phenylalanine, Tyrosine, and other precursors to dopamine, which is our happy, motivation, concentration neurotransmitter. Dr. Cass: I explain how you use them, and then the big booster for all of these is CBD. I’m still using all my supplements. I’m not at all giving them up, but they are very much boosted with CBD, which I call hemp oil extract, because in fact when we’re talking about CBD, it’s really just CBD. it’s the isolate, but hemp oil extract is the whole entourage with all the cannabinoids and terpenes. Joe: I had a question that popped when you were starting to dive into all of those supplements and something that I’ve been curious about as we release more and more products ourself, with hemp oil, with your Brain Function AM and PM, with everything else that you’re bring out there, a lot of these are … Well, everything’s basically rooted in nature. Finding … Is there … Let’s start with CBD specifically. Is there a saturation point? Is there like a bell curve of efficacy of the actual … Finding that correct dosage and if you go past it it’s no longer gonna be effective, and then with everything that you’re selling, is that the case? How about coming off? Like cycling off of exogenous cannabinoids and then coming back on? Is that stuff that we have to look at? Dr. Cass: It’s really variable. It’s so variable, just like doses are very variable. You start off low and slow, and sometimes one dropper is gonna be enough. Sometimes you need four droppers. It totally depends on your endocannabinoid system. Right now we’re not measuring that. We’re … There’s a lot lab tests, but that’s not one of them. It’s available as research, but we … The best way to test is, how much CBD do you need so you get the effect? Dr. Cass: If your target symptom is anxiety, how much do you need to quell the anxiety? If it’s pain … I’ve had people with sciatica, give them a dropper full, “Well, it’s sort of okay.” Second dropper, “That did it. Okay”, and then they determine what their daily dose is and it works, and they don’t have to be on the other pain meds, which actually can make pain worse. The opiates can make pain worse. It works [crosstalk 00:47:47] in lieu of the opiates and does a really bang up job. Joe: Gradual … Yeah, yeah. It was like, “Well, come off and see if you see any difference.” It’s … It’s so exactly what you said, subtle. Joe: Yeah, it’s extremely interesting [crosstalk 00:49:18] and like we’ve discussed, no right now reported side effects, so it’s like it’s kind of a win-win situation. You don’t have anything to lose, and let’s say, hey, it works for you, the money, everything that you can actually be saving and changing … I always tell people, “I don’t see why you wouldn’t try it, but” … Who knows? Dr. Cass: By the way, about side … I never say never. I never say never, like, “No side effects.” Everybody can have a side effect. Dr. Cass: If you feel a side effect, check with your health professional if they’re in fact the ones prescribing it, because people have experienced things like nausea or lightheadedness at times. Also, when you’re combining it with a medication, if they’re both being detoxified by the same enzyme, the same liver enzyme, there could be some interference. Usually if you’re under say 60 milligrams, it’s not likely to happen, so you’re pretty much in the safe zone. As you get higher, there’s more of an issue. Joe: Also something to note for everybody out there listening, we’ve had … Understanding the carrier oils as well. Sometimes people have adverse reactions to carrier oils and if you’re putting a bunch of … If you’re swallowing a bunch of MCT oil, it is a laxative, so you may see something happen there, but something to always evaluate. Maybe it’s not the actual cannabinoid extract, maybe it’s the carrier oil, so just be … For every user out there, if you’re not using carrier, if you’re not using any of Dr. Cass’ supplements, just understanding the other ingredients that are in products is something that we’ve always talked about as well. Dr. Cass: Yeah, always believe your body. If you’re having a reaction, please believe your body. Don’t try to power through it. It’s a message. Joe: 100%. Well, Dr. Cass, I appreciate you so much for spending time with me here this morning. I know you have a phone call to run off to very soon, but I think we could have sat here for hours and hours like your email response to me yesterday. I think you’re putting together a course through all the content that you’re putting out into this world, so thank you [crosstalk 00:51:31] for all your knowledge. I honestly really appreciate it and appreciate your time here this morning. Dr. Cass: Thank you. I also … I did The Amazing Itty Bitty Book of Cannabis. It’s on my website. Dr. Cass: Yeah, [crosstalk 00:51:45] cassmd.com. Yeah, and my other books, too. Okay. Dr. Cass: It’s been a pleasure. This was great. Thank you so much. Anytime.